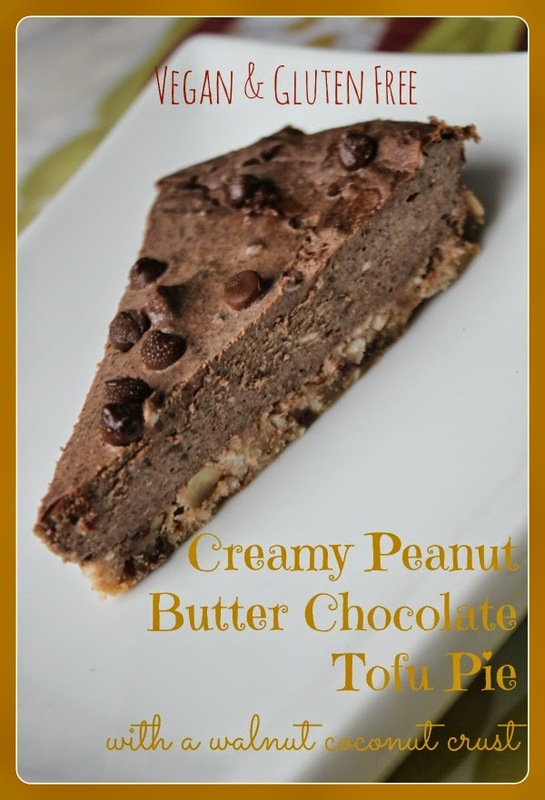 MamaEatsClean: Happy Birthday to Me with a Silkken Peanut Butter Chocolate Pie! Vegan and Grain Free! Happy Birthday to Me with a Silkken Peanut Butter Chocolate Pie! Vegan and Grain Free! 2) Other than the stomach flu that has been circulating our house and normal monthly hormone fluctuations I have been feeling really good. Throughout our summer adventures (and there have been many) I have managed to stick to my grain-free, dairy-free, low sugar diet. I actually can't believe I did that given how much time I spent away from my kitchen. Yes - I am proud of myself. It would have been very easy to let things slide but after my anxiety fueled spring I was pretty motivated to stay off the crazy train. And its working. If I stay away from grains (okay - I have a couple bites here and there but never a serving) I don't have anxiety. Low grade stress and worry - yes. Honest to goodness fear and anxiety - no. So that's what I have been doing. Along with banishing my anxiety I've noticed a few other benefits of "keeping it clean". My skin is clearer, my moods are WAY more stable, I rarely get grumpy, my stomach works properly, I have more energy and my monthly cycle is way less volatile. And I haven't had brain fog all summer. This all translates into THE MOST AMAZING SUMMER OF MY LIFE. Its crazy and hectic and the kids drive me crazy lots of the time but I'm in the right frame of mind and have enough energy to sail through the madness and appreciate the all the beauty and blessing around me. Over the past 7 years its not that I haven't enjoyed my kids - I have. But more often than not I went through hours, days, weeks or months of just struggling to get through the days. Fighting to feel like myself, trying to shake off fatigue, stomach aches, brain fog, moodiness, anxiety, etc, etc, etc. This is the first time in a while that I have felt CONSISTENTLY good for hours, days, weeks, months. Yay! I am grateful for my new job that allowed me to keep all three kids home for the summer. I am grateful that all three of my kids are healthy and FINALLY sleep through the night. I am grateful that we have the money to do so many fun things with the kids. I am grateful that my husband has been so supportive of my lifestyle changes and even thought his inclination is to hang out at home he lets me drag us around the city and province to enjoy summer out and about. I am grateful that I was able to figure out my food sensitivities - it has changed my health but its very hard to do. I am grateful that I "hit rock bottom and burned out". It has made me completely change how I live my life. And although I have had to "give up" many things I have gained so much in return. Giving things up doesn't have to mean losing...........it can just force you to make new discoveries. And its worth the effort. One of my discoveries has been Silkken tofu..............................its magic! So I made myself a magical pie - because the chances of someone else making me a grain and dairy free Birthday cake are slim to none - and that's okay! Now I gotta run................there's still a week of playing summer to enjoy! Preheat the oven to 350 degrees. Grease an 8 inch pie plate (I used a glass one). I roughly chopped the dates before soaking them. I used my coffee grinder to roughly chop/puree both the dates and the walnuts. I then mixed all the crust ingredients together (including the leftover water from soaking the dates) until the earth balance was full incorporated throughout. If my food processor was working I would have just thrown everything in and processed it together. Work with what you have. Press the crust mixture into the pie pan - including up the sides. Make sure it is not loose or it will crumble later. I melted the chocolate squares in the microwave in a glass dish (60 minutes, stir and then an additional 30 seconds) to have it ready. I then blended the tofu in my high speed blender until smooth. Depending on your blender you may have to stop and scrape down the sides a couple of times. I then added all the remaining ingredients, including melted chocolate, and blended until smooth. Again you may need to stop and scrape down the sides. Blend until JUST smooth. Do not over-blend. Add the filling to the baked pie crust and put it back in the oven. Bake for 30 minutes. Remove from oven and let cool. Refrigerate and serve chilled. Thanks for your truthful posts. I'm in the same position with bad anxiety due to adrenal fatigue. How long does it take for you to feel better ? I wish I had the answer for you..........It is a daily battle for me to keep sticking to my diet, taking my supplements and trying my hardest to not live in a constant state of "over-whelm". It has been a long road with lots of ups and downs so its hard to say how long it took to feel better. I must say that when I gave up grains it only took three days for my anxiety to disappear but that was after almost two years of lots of other changes (changing jobs, giving up dairy, going to sleep by 10, taking supplements, etc, etc, etc) so not a realistic expectation. But you CAN GET BETTER. Anxiety is a shout out from your body that something is out of balance. Keep working on it one day at a time and don't feel guilty about taking the time to care for yourself! Its so worth all the trouble!